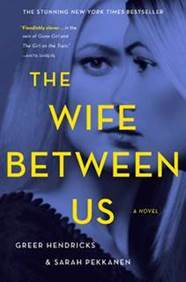 The Wife Between Us by Greer Hendricks and Sarah Pekkanen is a thriller that has been receiving really good reviews since it arrived on the book scene in January. I don’t tend to read thrillers these days because I like my sleep but this one intrigued me. I couldn’t fit it into my schedule until August so I’ll be posting my review then. Read on to learn about the book. Then enter the giveaway for an exciting prize package thanks to St. Martin’s Press who is the sponsor.